LoLo is the newest addition to a lovely family from Lees Summit that I have known since my late teens. Mom and I were chemistry partners in college. I was actually also their wedding photographer! Always so great to see them. Sweet little LoLo, she is just full of expression, looks so much like her sister was at this age. I am loving this little floral romper I purchased from Posh Peanut in the last image. We got her in a variety of outfits and the dress Grandma bought for her! We chose a wooden flower backdrop and a gray damask. LoLo tolerated mom changing her outfit four times, I have to say this is unusual! Mom and I thought the wooden flowers would go well with her denim. I gave her a vintage school chair, which she thought was the best thing, ever. 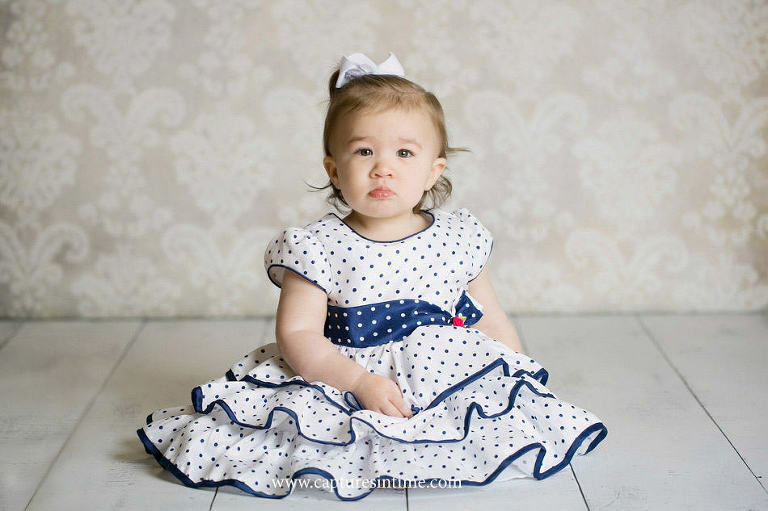 Susan brought along a sweet, polka dot dress that her mom had found for LoLo. She also had a pink dress that reminded me of Jaqueline Kennedy. (Love that). I had just received a floral romper in the mail, so LoLo was a trooper to wear it as well. 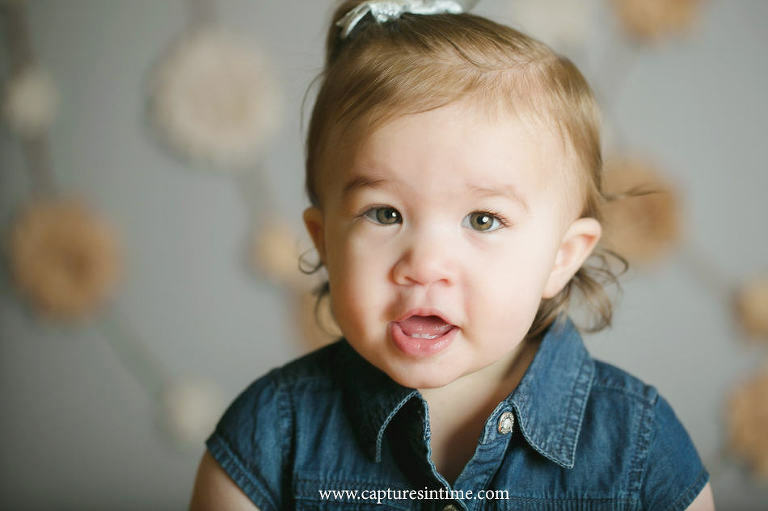 One thing about toddler studio photography. You don’t need to worry about shoes, it is much more natural without them. 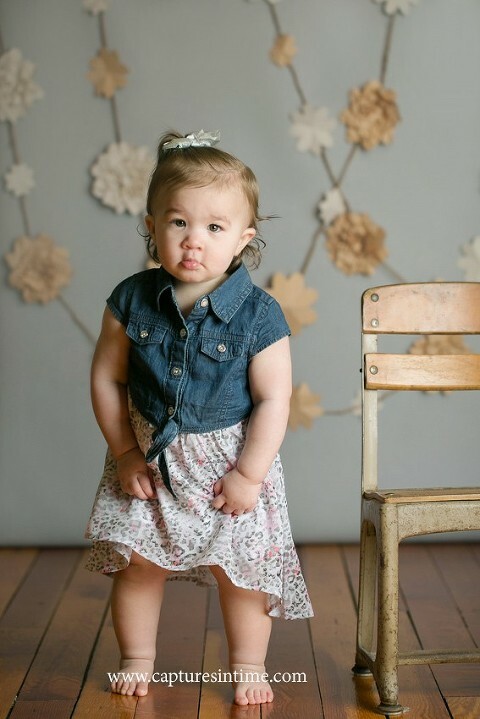 When toddler sits down, more than likely we will get scuffed soles in the picture and their cute, chunky feel are so much cuter than the bottom of a shoe! 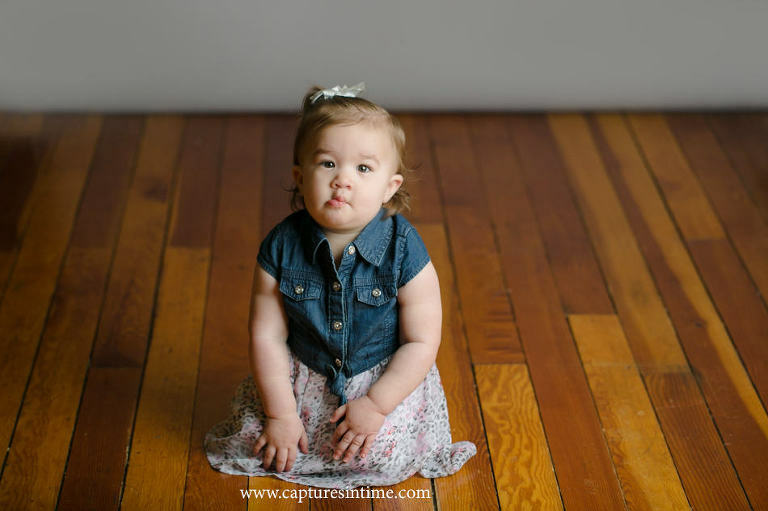 Captures in Time Photography gives you many options to preserve your baby’s first years in heirloom studio photography. Our Tiny Toes baby document’s your baby’s big milestones that the first year with a newborn, six month and one year session. A three-month session may be added for a discounted fee. All of the digital files from your galleries are included with the Tiny Toes plan. I design many coffee table books and albums for clients with each session in chronological order. My professional products and books are a wonderful quality. Interested in learning more about our baby sessions? See our pricing & calendar page for details!